The annual Anapali Festival of Dance is held in the Dora Stratou garden theatre, in the idyllic surroundings of the Philopappou Hill, opposite the Acropolis. Members of the International Dance Council and dancers from all over the world present their work and perform at this prestigious festival. After becoming a member of The International Dance Council (CID) I met its President Professor Alkis Raftis and his management team during a short visit to Athens earlier last year. I learned of their interest in seeing Classical Greek Dancing in the beautiful setting of the garden theatre and enjoying the results of Ruby Ginner’s tireless research in the Greek culture and way of life which formed the very foundation of her inspired work. After being warmly invited to take some dancers to perform in the Anapali festival I realized what a unique and unmissable opportunity it would be for my senior dancers to be part of this exciting occasion and to be given a chance to perform a Classical Greek dance in the country of its roots. Together the students and I choreographed our ‘Dedication’, a five minute dance which included lyrical, athletic and ritual styles of the technique; ending with a poignant interpretation of Irene Mawer’s words (A Prayer) voiced by my late mother Diana Griffiths. Last July, on a very hot summer’s evening, all the performers and audience were warmly welcomed by Professor Raftis who presented the dancers with certificates. It was a truly memorable evening with a programme brimming with a diversity of dance techniques. 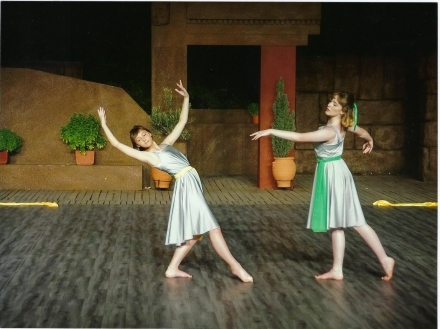 As I watched my Classical Greek Dance students perform so beautifully under the stars and moonlit Athenian sky, and listened to Irene Mawer’s poignant words I couldn’t help but feel a sense of gratitude that I have had the opportunity to experience the work and inspiration of Ruby Ginner, her legacy …. and magic …. There steals the scent of olive trees. And the dawn-light on the far Ionian sea. Annabel and Jess rehearsing "Dedication" for their forthcoming trip to Athens and the Anapoli Festival next weekend.